We have collected some of the most frequently asked questions, and sincerely hope you will find your answer(s) here. If you prefer, however, you can visit one of our classes and find out more for yourself by watching our training and, if necessary, getting assistance from the instructor afterwards. Please refer to About Us section for detailed explanation. Are all martial arts the same? In short, no. 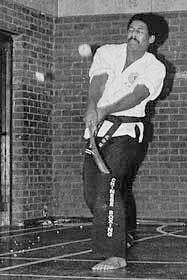 They exist in many forms and guises, a lot of which are a mere physical pastime or a tradition of make-believe; some are far from complete to be an effective self-defence system, while others lag behind in the modern science of physical training. 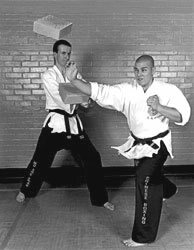 Whereas Wu Shu Kwan is entirely different in that our style is based on a practical and effective system, and we offer a structured progressive training which will enable any aspiring martial artist to reach the very top. Everyone, man or woman, young or old, can certainly benefit from competent instruction. Do I have to be fit at all before I start training? No. Wu Shu Kwan Chinese Boxing training will take you progressively and without strain right from your present unfit state to an envious peak physical condition. Just train regularly and you will be transformed automatically. About 2 hours. Beginners will have plenty of rest in between exercises, whereas the intermediate and the advanced students have progressively shorter resting periods. Normally, the class is conducted in such a way that the beginners will not be too tired at the end of the session while the advanced will have beneficially spent their physical energy feeling relaxed, well and satisfied after the training. Once a week is about the minimum, twice a week will ensure more rapid progress and thrice a week will just be about sufficient to achieve maximum progress. 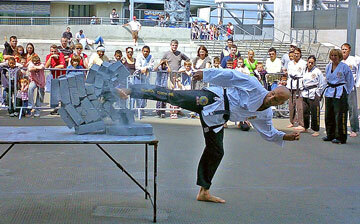 Some dedicated martial artists enjoy training every day. It depends on how often you train and your initial physical condition. With each session you will find yourself fitter and more proficient. 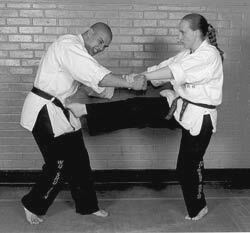 As a general rule, the basic skills of self-defence can be learned in a few months or even weeks. However, the longer you train the better you become – the sky is the limit. I am a complete beginner, can I join up and train? Beginners are most welcome. Whenever you are ready to start, there is always a beginners’ course available each week. You will find the training challenging, exciting and enjoyable; before long, you will be amazed at your progress under proper guidance and wish you had started sooner. You will make a lot of friends too. Give it a go. Very often, making up your mind is indeed much more difficult than the actual training itself. Kuwar Singh (left), a security officer, successfully punching 12 roofing tiles to pass the Wu Shu Kwan Black Belt grading at the age of nearly 65 – a colossal feat even for anyone a third of his age! Men and women, young and old can all benefit from proven Wu Shu Kwan training. A young girl member (right) showing tremendous breaking power. 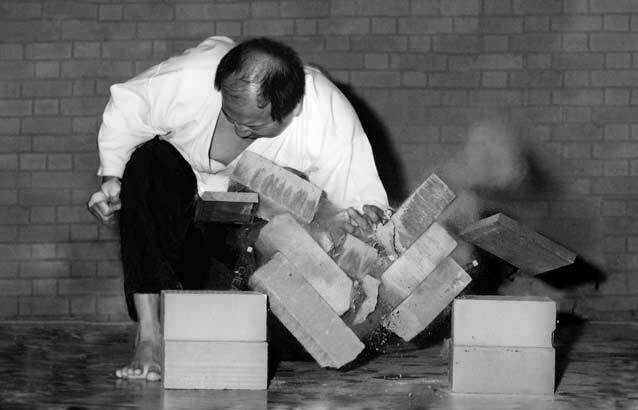 Peter Johnson (6th Degree Black Belt), a Senior Master, breaking 7 building blocks placed upright on a table. The total thickness of these blocks is more than two normal walls. The kicking power that can be achieved through Wu Shu Kwan training has to be experienced to be believed. 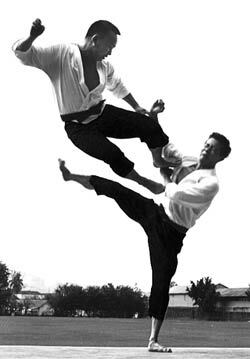 Grand Master C. K. Chang (8th Degree Black Belt) demonstrating a perfect double-legged flying side kick — a movement often imitated but hardly equalled. Colin Johnson (7th Degree Black Belt), a Senior Master, splitting an apple with a sword. He is very famous in the martial art world. 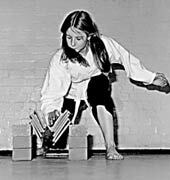 Trish Chang (7th Degree Black Belt), a Senior Master Instructress and a Guinness World Recorder holder, showing how to defend herself against a very strong attacker. 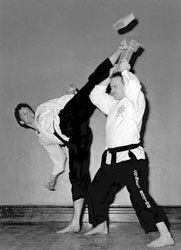 Paul Walters (2nd Degree Black Belt), a Senior Master, kicking a building block on someone's head with his back heel. 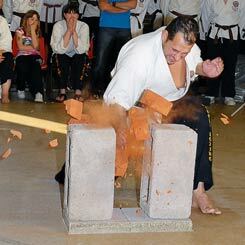 Mr Nasri Zreik (2nd Degree Black Belt), a practising orthopaedic surgeon, pulverising 2 building bricks with a powerful chop. Shane Gabriel (3rd Degree Black Belt), a Senior Master and the British Middleweight Champion, breaking a building block with an iron palm technique. Eddie Cheah (8th Degree Black Belt), a Senior Master and one of the highest-ranked martial artists in the world, is a master of Chinese breaking techniques. He can be seen here using his backhand to demolish a pile of building blocks.